“Runs end, Running doesn’t,” says an adage. Mankind from the minute they are born into this world, find themselves running a rat race chasing wild dreams to achieve their goals and settle down against all odds. For a person who feels elated on taking the stairs during a commute to the third floor and triumphant on reaching 5k steps on my neoteric fitness band, I felt astounded reading Anu Vaidyanathan‘s memoir “Anywhere But Home: Adventures in Endurance“. I have seen people who have always thought of hitting the road to train for an upcoming half-marathon. But laziness peeps in and they seldom train, letting the dreams of running in a half-marathon reside in their brain’s cache. (Include me in this never-ending list). I haven’t heard the word Ultraman / Ironman ever in my life until I read this memoir. Those two terms set alight the curiosity inside me which lead to reading this beautiful memoir which chronicles the experiences of an endurance athlete who became the first Asian woman to compete in the Ultraman Canada. Both Ultraman and Ironman are taxing, nerve-racking events testing the tenacity and the endurance of an athlete. FYI, The Ultraman involves a 10-km swim, a 420-km bike ride, and an 84.4 km run and the Ironman involves a 3.8 km swim, a 180-km bike ride, a 42.2 km run. This debut memoir takes you through a journey of an Indian endurance athlete drudging through tough conditions which culminated in her becoming the first woman Asian athlete to complete the Ultraman Canada. Anu has titled the book aptly “Anywhere But Home” for which she also gives the reason behind choosing this over “Strive” which she felt sounded like a self-help book or “Higher Ground” like the UB40 song in a chapter. The 184-pages short memoir is a series of anecdotes neatly divided into chapters that have idiosyncratic titles like Triskaidekaphobia, Inheritance O’Floss and Thespians and Thayirsadham. Anu begins each chapter with an adage/verses from famous books/lyrics of a song which sets the tone of that particular chapter which I found was refreshing for the readers who are yet to enter the realms of her words. The pace of the book was slow at times which was saved by the author’s wry humor. The writing exudes much positiveness inside of the readers which had lead me to re-read the book. The author’s tryst with training in Bangalore chased by a pack of dogs, flocked by spectators among the gushing traffic, her calm runs along the trees of Madison where she spoke with the trees, cycling along the elevations of New Zealand and wondering why Chinese women weren’t present at an event in China makes us experience and realize her thoughts in the process of reading this memoir. This book comes down assuring the readers that whatever be the odds at stake, never give up in your life and run till the end once you have started. I wouldn’t say this book opened my eyes and inspired me to run and compete in a marathon. No, it didn’t. But like Morgan, the kid who cheered for Anu during the Ultraman Canada and was waiting for her at the finish line as promised with no expectations, I too ended up inspired to brave against all odds in whatever I do like Morgan would have been witnessing Anu finish the Ultraman. 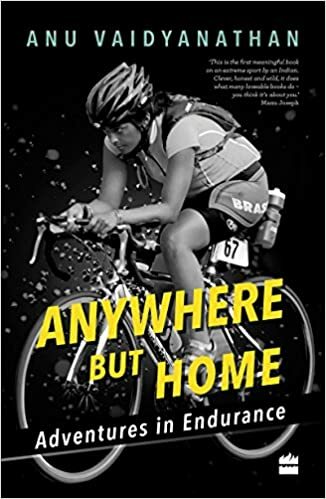 This is a light-hearted memoir about the experiences of an endurance athlete with her solitary pursuit of competing for the Ultraman and the Ironman. “The trees did not judge, forewarn or worry about the weather. They just stood there, breathing magic air into my lungs asking for nothing back from me”. “No matter how good you look, You still have to work hard to become good at anything”. “Maybe friction was the only way to start a fire”.